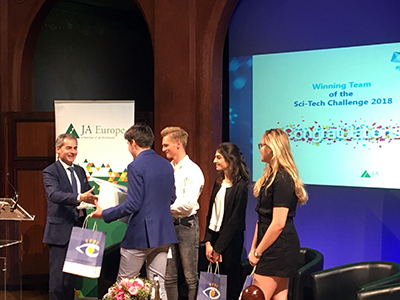 Year after year, JA Europe and ExxonMobil have been working in close collaboration to motivate young people to pursue STEM-related studies and careers through the Sci-Tech Challenge initiative. The comprehensive programme offers mentoring opportunities and a European challenge encouraging youngsters to use and develop their STEM skills. The Sci-Tech Challenge ultimately aims to help develop a skilled workforce, ready to drive innovation and growth in Europe. In 2017-2018, more than 4,000 students took part in the Sci-Tech Challenge, that concluded in March in an innovation camp at national level, where they had to come up with solutions to make a city’s public transport system as environmentally-friendly as possible for the 2020 UEFA European Football Championship. The four national winning teams were then invited to Brussels to participate in a final 24h innovation camp. Students came together in multinational teams supported by experienced volunteers from ExxonMobil to build a European supply chain taking into account the environmental impact. During the European grand finale on 17 May 2018, five teams presented their innovative solutions to an international jury panel, composed of Johan Scharpé, EU Affairs Manager, ExxonMobil; Alysia Tofflemire, Environment & CSR Policy Manager, Boeing; Artur Runge - Metzger, Director ‘Climate Strategy, governance and emissions from non-trading sectors’, DG Climate Action, European Commission; Sharon Hauber, Europe Region HR Workforce Planning Director, UPS; and Peter Vis, Adviser at the European Political Strategy Center of the European Commission. The jury selected the best team based on a great combination of team spirit, entrepreneurship and scientific knowledge. Giulia Cunsolo, Andreea Seder, Stijn van de Werken, and Vad-Andrei came up with an innovative transportation network for supplying food, clothing and furniture by using renewable energy such as hybrid trains and trucks using biofuels; solar panel and wind turbines. By having experienced employees participate as role models in the programme, ExxonMobil actively helps students understand the growing importance of STEM skills for a range of exciting professions, which will contribute to spurring innovation and technology development in Europe. Johan Scharpé, EU Affairs Manager at ExxonMobil, concludes: “New technologies and innovative ideas will be critical to tackle the energy challenges of the future. Therefore, supporting the development of STEM skills among young people through programmes like the Sci-Tech Challenge is vital to achieving low-emission mobility for Europe”. For the ninth consecutive year, the Sci-Tech Challenge aims to encourage students, aged 15-18, to consider Science, Technology, Engineering & Math (STEM) oriented careers, raise awareness of the importance of STEM skills and how these can be applied in enterprising ways to tackle the challenges of tomorrow. The Sci-Tech Challenge currently takes place in four European countries. It gives over 4000 young people in secondary schools the opportunity to participate in the programme each academic year. Over 50 employees from ExxonMobil participate as volunteers. 120 teachers experience the Sci-Tech Challenge each academic year. JA Europe is Europe’s largest provider of education programmes for entrepreneurship, work readiness and financial literacy, reaching 3.6 million students in 40 countries in 2017. JA Europe brings the public and private sectors together to provide young people in primary and secondary schools and early university with high-quality education programmes to teach them about enterprise, entrepreneurship, business and economics in a practical way. JA Europe is the European Regional Operating Centre for JA Worldwide® (www.jaworldwide.org).